THE HORRENDOUS losses of Anglo Irish Bank come as no great surprise to informed analysts of the banking catastrophe. The Government s solutions amount to no more than insisting the taxpayer must, under all circumstances, bear all the losses Anglo will continue to create. This cannot be borne. That there are significant additional losses to come from Anglo is undoubted. The Government and its proxies continue to assert, without placing in the public domain any detailed analyses, that the losses will be capped at EUR 25 billion. This is the same process that has successively asserted that the losses will be EUR 4.5 billion, EUR 12 billion, etc. Why are we expected to believe them now, when they have proven to be wildly inaccurate in the past? Analysts inside and outside Ireland believe Anglo s losses will be at least EUR 35 billion with potential for EUR 40 billion-plus. Anglo, like all banks, is funded in five ways: deposits; borrowings /deposits of a short-term nature from other banks and central banks; longer-term borrowing (senior debt); longer-term borrowing with less protection (subordinated debt), and by shareholders. The question that arises is simple: which of these should be protected in full, and which in part? It is startling that, as of now, only the most junior party, the shareholders, have been asked to take the full consequences. Some subordinated debt has been (voluntarily) renegotiated, but there remains some EUR 2.5 billion of subordinated debt in Anglo. This should now absorb the next EUR 2.5 billion of losses. It is unfortunate that the Government has guaranteed some of this, but this is a legislative act and can be unwound. Beyond that, we are into the realm of senior debt holders. Anglo has borrowed some EUR 14 billion from such investors, of which some EUR 7 billion is repayable in September. It is now beyond time that these investors be informed that their investment is not fully payable. There is more than enough in the subordinated and senior bondholders to absorb even the most pessimistic estimates of losses to emerge from Anglo. We can, and I say we should, consider this. We are told by the Government that to do so would be a sovereign default. This is palpable nonsense. Anglo Irish is a private institution, which has some elements of its capital structure guaranteed by the Government. It is not the State. The reason the guarantee was given was the fear that allowing Anglo to be wound down in 2008 would have precipitated a cascade of Irish bank failures. While this is debatable, we are now in 2010. The taxpayer has paid enough. Governments have a genuine concern that if a state defaults, it may not be able to re-access bond markets. But even if we allow the fantasy that Anglo is the same as the State, assertions that this chimera would be locked out of the international bond markets are false, and are pedalled as a scare story to frighten the taxpayers and citizens into ponying up sovereign money to bail out private investors. Bond investors look forward what they are interested in is the risk that they will not be repaid. A history of default will of course impact on the amount of money they will lend, and the price they will charge. But the evidence is that even serial defaulters can gain funds on an ongoing basis. Academic evidence, including papers from the International Monetary Fund, indicates absolutely no evidence that sovereign investors are permanently excluded from the international capital markets after a default. Even in the rare cases of temporary exclusions, in the sense of not being able to issue bonds, this rarely lasts for more than two years. In addition, the evidence is that any increase in sovereign debt costs is short-lived and transitory. 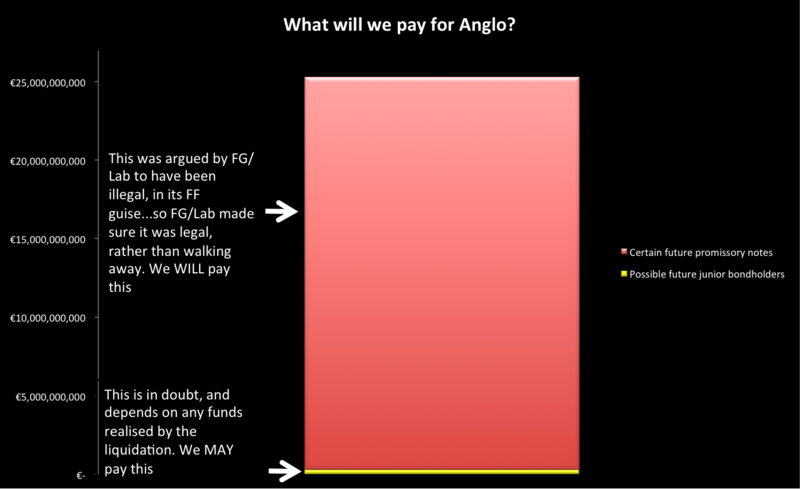 We have to decide: is the price for the taxpayer of any increased cost of lending if we discontinue support to Anglo, less than the cost of continued support? There is in my mind no question now but that there is a moral, political, economic and social need for the subordinated and senior debt holders of Anglo Irish Bank to bear the remaining costs. There is a timing problem, however any announcement of the intention to force these losses on the senior bondholders would have to come prior to the renewal of the guarantee at the end of September. Thus, the next three weeks are critical. There is an argument that this decision to withdraw the guarantee should be taken in conjunction with another. The State is now paying more for money than it would if it were to access the EU stability fund. The judgment of the bond markets is that the combined banking and fiscal crises are such that Ireland is no longer a sound bet. A very large part of this is the increasing concern that there is not the political will to deal with either of these problems, never mind both. Pulling the plug on further taxpayer involvement in Anglo may best be done at the same time as announcing that we are to seek the assistance of the EU in restructuring our fiscal position. It is time to seek to place ourselves in the hands of people who can run the State effectively and in the long-term interests of the citizens. Political or indeed national pride should not stand in the way of this. This entry was posted in Blogpost, Journalism and tagged Academia, Anglo, banking, bondholders, ECB, economy on August 12, 2013 by brianmlucey. OPINION:The IMF report most certainly does not give Government banking policy the thumbs up, writes BRIAN LUCEY. THE STATE of the Irish banking system remains parlous. This is particularly evident in its capital base. Notwithstanding the financial engineering of recent months, which has released capital through debt restructuring, Irish banks remain undercapitalised to meet regulatory and likely future losses. Estimates by Oliver O Shea ( Restarting flow of credit the most immediate challenge facing main banks , The Irish Times, May 23rd) suggest that even under very optimistic scenarios total capital available to the main Irish banks is no more than EUR 50 billion. It is also useful to recognise that regulatory minimum ratios for capital are now significantly less than the market desired ratios. In plain language, although banks may well pass legal tests of being adequately capitalised, they may not pass market tests. The present state of the Government s dealings with banks might best be described as piecemeal a smidgen of guarantee here, a dollop of preference shares over there, a bit of urging to restructure here, a nudge towards bolstering common stock elsewhere, and an overarching commitment to preserve the banks in as majority a public ownership as possible. Meanwhile, banks profit bases remain under stress and are unlikely to provide the tens of billions required to rebuild the balance sheets. The International Monetary Fund (IMF), in its article IV consultation report just published, places the banking crisis front and centre. Its analysis of the response of the Government is damning. It is important to recognise the report is ultimately a political document and would have been drafted and redrafted. Thus any comments critical of the actions of the State must be read as having passed through several formal and informal filters prior to final publication. The IMF starts its analysis with an estimate of bank losses of some EUR 35 billion. It is a massive indictment of the quality and competence of Irish economic governance that they state, on page 15, The authorities did not formally produce any estimate for aggregate bank losses. In plain language, the Department of Finance either did not present or did not have any idea of the scale of the likely losses. It quite literally beggars belief that nine months into the crisis this could be the case. If the department does not have estimates, then it is grossly delinquent. If it does have estimates, and did not present them to the IMF, then one wonders what is being hidden. In any case, a loss of EUR 35 billion would render the Irish banks undercapitalised from a regulatory standpoint and most probably would result in their being economically insolvent. The IMF report then examines the National Asset Management Agency (Nama) and emphasises over several paragraphs the importance of the new agency cleaning up the bank balance sheets swiftly and completely. Yet, we see (on page 19), They [the Department of Finance] agreed that piecemeal efforts could keep banks dependent on official support and unable to resume normal functioning. The Japanese experience is particularly cautionary. This should chill the blood of any reader: the Department of Finance, which has led partial effort after partial effort to solve the banking crisis, and which is committed to more partial efforts, accepts that if these do not work, the economy faces a lost decade. Indeed, in that paragraph, the Department of Finance is reported as saying also: The authorities took note of these considerations for their further deliberations on setting up Nama. Nine months into the crisis, five months after Nama was announced, and the department is considering further deliberations on Nama? No rush lads . . . The IMF concludes with an analysis which echoes in all important elements the opinion in this newspaper (April 17th) of 20 economists (of whom I was one) that nationalisation plus Nama may be the way forward. The report states, Staff noted that nationalisation could become necessary but should be seen as complementary to Nama. Where the size of its impaired assets renders a bank critically undercapitalised or insolvent, the only real option may be temporary nationalisation . . . Having taken control of the bank, the shareholders would be fully diluted in the interest of protecting the taxpayer and thus preserving the political legitimacy of the initiative. The bad assets would still be carved out, but the thorny issue of purchase price would be less important, and the period of price discovery longer, since the transactions are between two Government-owned entities. The management of the full range of bad assets would proceed under the Nama structure. Nationalisation could also be used to effect needed mergers in the absence of more far-reaching resolution techniques. Recall when reading this that the IMF has stated the losses are such as to leave the banks in a position of undercapitalisation at best. This argument from them echoes the almost unanimous consensus of academic finance observers. However, undaunted, the department (who, remember, don t seem to know the magnitude of the problem they are trying to solve) disagreed. However, their arguments (on page 19 of the report) are straw men the need for nationalised banks to operate under the same regulatory regimes as non-nationalised ones, the need for a clear exit strategy, the need for lack of politicisation of lending that have been discussed and to which solutions have been suggested in many forums including this newspaper. So we are left with a Minister committed to incrementalism in solving a crisis the magnitude of which his department professes ignorance of, an incrementalism the department agrees runs the risk of a lost decade, and a determined if unargued rejection of all advice (internal and external) relating to the efficacy of the sole solution proposed. And we wonder why the country is in crisis? This entry was posted in Blogpost, Journalism and tagged Academia, Anglo, banking, banks, bondholders, economy on August 12, 2013 by brianmlucey. WITH THE onset of the recession, much talk has emerged of a return to the 1980s. We might do well to remember the injunction written in bold on the face of the mythical Hitchhiker’s Guide to the Galaxy, which was “don’t panic”. This is advice the Government might well take to heart. The Government is facing unprecedented challenges economically – not only is a full-blown recession now crystallised, but the banking system sees its capital eroded daily and a pensions crisis looms in both the public and private sector. However dire, these are soluble problems given leadership and clarity. It is in this context that we must judge the plan announced on Thursday for economic recovery. If it is not to suffer the same negative reaction as the bank plan, we would expect to see clarity and simplicity. Neither are obvious, with a document running to more than 100 pages replete with analyses and aspirations but lacking, to my mind at least, a clear focus. The context for this document was the third quarter of 2008 national accounts and the ESRI report published yesterday. Both confirmed what was already suspected – the economy did not experience a soft landing but has instead crashed in spectacular fashion. This confirmation was foreshadowed by truly disastrous retail sales figures and recent rises in unemployment. The ESRI is not known for its hyperbole, and this makes its latest report sobering reading. It predicts that in 2009 the economy will shrink across the board, with unemployment rates again in double digits, against a backdrop of a marked deterioration in public finances. In that context, immediate decisive action would reasonably be expected but this has not happened. The recovery plan announced by Brian Cowen has three major elements: restoring the public finances; dealing with the immediate consequences of the recession’s victims; and positioning Ireland for the future. All of these issues, however, are discussed and analysed in the document, with paths forward identified and options noted. In many respects, it reads more like one from an external body such as the OECD or an election manifesto rather than from the office of the leader of the country. There is a sense throughout that someone should do something, with little specifics on what the Government will do in the immediate future. And where there are specifics, there is some evidence of lack of internal consistency. For example, the single largest immediate problem facing the economy is the mismatch between expenditure and revenue. On the revenue side, we have a narrow tax base, with preponderant taxes being raised on consumption and earned income. Despite this, the plan merely encourages the Commission on Taxation to consider a speedy conclusion to its work on examining a wider tax base. Indeed, the document later goes on to explicitly rule out much movement in relative tax incidence. A key feature of the problem we face is our high cost-base, in part due to high direct and consumption taxes – but again this is merely noted with no specifics given for how it is to be addressed. For young unemployed people, encouragement will be given to them to take up unused places in institutes of technology but there is no analysis of the likely impact of this on the already unacceptably high dropout rates in the very programmes identified. 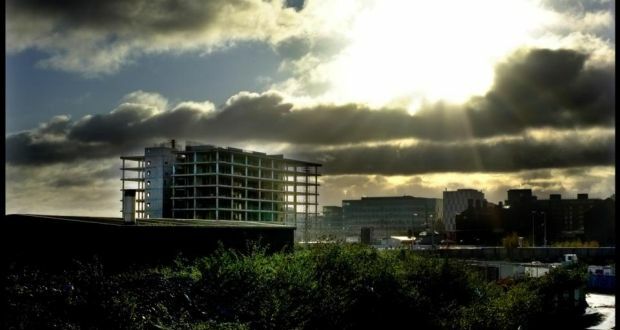 To reinvigorate the International Financial Services Centre (IFSC), it will be vigorously promoted to sovereign wealth funds and specialist services, but there is no specificity on why these would want to move to the IFSC, what the comparative advantage is of the IFSC in these areas and, crucially, no indication of the Government implementing the 2007 PricewaterhouseCoopers report on financial services education. There are many other examples. Overall the document reads not so much as a blueprint but as an aspiration, one that moreover appears at times to lack internal consistency and logic. Two elements of the document show its weakness very clearly. First, the document repeatedly makes reference to increases in Science Foundation Ireland (SFI) and related funding, all predicated on moving towards a knowledge economy. However, all available research indicates that fundamental research skills and fundamental skills in the basics of educational attainment (the three Rs) are more important in determining long-term economic success than are targeted initiatives such as SFI – no matter how useful they may be as “add-ons”. In this regard, the most glaring omission from the document is in regard to tackling the deficit in mathematics skills in Ireland. Report after report has indicated that this area is the single greatest constraint on positioning Ireland for the future high-skills, high-value-added economy. Mathematics are mentioned twice in a 102-page report, in the same paragraph, where the problem is merely nodded towards. Against a background of overcrowded classrooms, a lack of specific mathematics teachers in the primary level and increasing difficulty in third level in finding students with the minimal level of mathematics to take IT and science subjects, the level of aspiration is high and detail low. Second, a further key building block of the document is the creation of a venture capital funding mechanism to direct investment towards high-tech start-ups. Throughout the report, attention is drawn to the underdeveloped nature of the Irish venture capital sector, despite the reasonably favourable tax and related infrastructure for it that already exists. The proposals are in essence threefold: to create a set of five funds totalling approximately EUR 500 million with the National Pension Reserve Fund (NPRF) injecting half and external private equity half; that these would invest with a seven-year horizon; and that they would invest in “early stage RD intensive SMEs”. The underlying implications are that there is an existing failure in the market that starves these sort of enterprises of this funding, that there are returns to be made for the NPRF from such investments that are at least as good as can be made elsewhere, and that this investment is the appropriate form of investment. All of these can be challenged. Venture capital is a catch-all phrase that can be taken to encompass a wide variety of investments from angel capital (at the very initial stage of conception of an idea) through private equity for buyouts. The evidence is overwhelming that angel capital, not other forms, is the essential element of funding for start-ups. Regardless, the evidence from the European Venture Capital Association is that early-stage venture capital returns close to zero over a five to 10-year period such as is envisaged here. Finally, there is a thriving venture capital sector in Ireland but, given the preceding facts, it is not surprising to note that it is concentrated on buyouts and reorganisation. Now if only there was a set of distressed companies in Ireland that the NPRF could invest in . . Overall the document is not yet a plan. It is a precursor to a plan. What we now need to hope for is that the plan, when it does come, will come from the office of the Taoiseach and the Minister for Finance and not from that of Mr Strauss-Kahn of the IMF. This entry was posted in Blogpost, Journalism and tagged Academia, banks, bondholders, economy on August 12, 2013 by brianmlucey. The Banking Union: what’s in it for Ireland? The new banking union proposals that are now emerging from the wreckage of the European economy are to be given a (very) cautious welcome. Without going the whole Naomi Klein “shock doctrine” route, its very clear that once again this is a win for (mainly german) banking interests. They for one have not wasted a good crisis, unlike our hapless crew of permanent and transitory governments. Banks have walked away scot free, in essence, from the calamitous decisions they have made. In Ireland, faced with a government as weak as water they essentially bluffed and buffaloed a hapless crew of inepts into socialising the losses. Anybody who think that senior bank management have learned their lesson of humility need only look at the truculent faces when the elected representatives dare question their remuneration. A banking union required three essential elements: a common supervisor, a common system of deposit insurance or assurance, and a common method to resolve problems. What we have here is the first, and its as good a place to start as any. But without the others its a onelegged stool. The power in European banking has now shifted decisively to Frankfurt – already building an new towerblock (for a cost of over a billion euro…) the ECB will soon need more space. As presently proposed the effect of the new regulator will be to shift regulatory control of AIB, IBRC and BOI to Frankfurt. What exactly that will mean for the newly beefed up regulators office in Dame Street (the beefing up requiring that it move to the IBRC shell – very apt) is unclear. Will staff move to Frankfurt or more probably will it be a remote operation? On SME funding the Irish banks are in a bind. They need to continue to delever, and the only way to do that is to progressively increase the deposit base (costly) and/or reduce outstanding loans. In particular, reducing loans will be done while also shifting the balance of loans away from riskier towards less risky ventures. Lending to SME’s is inherently more risky than to more established sectors and ventures. The easiest venture at present is to obtain cheap money from the ECB and purchase Irish government bonds, a carry trade as it is known, reaping a handsome profit for the banks and incrementally driving up the price and down the yield on these bonds yielding a handsome political dividend for the government. Evidence from the ECB biannual survey on access to finance that along with Greece Irish SME’s are the most likely to be discouraged from applying for credit. Although only around 10%, this is unfortunate – discouraged borrowers may be borrowers that have excellent prospects but feel that there is no point seeking a loan. Since March 2010, when the data series begins, excluding property and financial services related lending, lending to the SME sector has fallen by 24%, while in the overall economy it has fallen by 22%. Within the SME sector lending to property and financial services related activity has risen by 30%. Its hard to see how this is justified given the job creation engine that the SME sector can be. As banks regulatory oversight moves more and more remote it is likely that the existing centralization of lending decisions at HQ will intensify. It is reasonable to assume that local managers of banks are more likely to be at least approachable by local SMEs seeking finance. If we wish to reduce discouragement in applicants we need to be very nimble in negotiating the parameters of this new regulatory regime. It’s a good job we have a history of nimble wily negotiators with the ECB…. The creation of the new regulatory framework was a quid pro quo for the establishement of the new ESM lending framework. This will lend to banks for new capital needs, finally breaking the linkage between the soverrign and the banking sector. However, this is of little use to Ireland. We have invested 24b in the pillar banks and 30b via the wretched promissory note in IBRC. The proposal on the table will not give us any relief on these. The government in march 2012 engaged in a complex shell game to avoid payment of the note but this was for a one year basis. Despite this can kicking they continue to claim that they have avoided repayment, which is simply untrue. Thus a solution to the deferred 3.1b and the regular 3.1b needs to be found before march. All indications are that this will involve a restructuring of the repayment schedule, to reduce the amount of money destroyed from 3.1b to perhaps 1b per annum. That anyone outside a lunatic asylum would consider it acceptable for a state so broke that it is cutting respite care to carers to destroy a billion euro shows how degraded our political debate has become. After Minister Rabbit stated that we would not pay in March I asked the Central Bank, the ECB and the government for a statement. Despite being the ultimate loser in any refusal to pay the Bank declined to comment. The ECB reiterated the statement by its president that it was Frankfurts way all the way, while the government press office reiterated that we hadn’t paid in 2012 and were seeking a deal. None of these give any hope that a meaningful reduction in the outstanding debt, as opposed to some restructuring of the payment schedule, is in the offing. That wont prevent the government from touting some form of interest reduction or extension of the repayment schedule as a triumph. But it should. This entry was posted in Blogpost, Journalism and tagged Anglo, banking, banks, bondholders, Central Bank, ECB, economy, Promissory Notes, SME on December 15, 2012 by brianmlucey.